Bright neon coloured 100% polyester air-mesh. Adjustable neck with buckles and hook ; loop fastener. 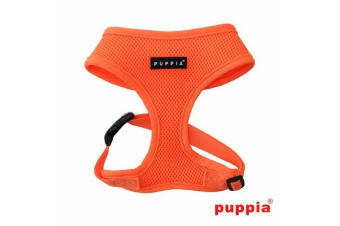 The Puppia Neon Dog Harness Orange is also available in pink and green. Size Information: Small: Breast Girth 36-48cm, Neck Girth 24-29cm. Medium: Breast Girth 38-58cm, Neck Girth 28-36cm. Large: Breast Girth 50-68cm, Neck Girth 32-40cm. Let your dog be seen in Neon! Would you prefer an LED Harness instead? Our USB Rechargeable Loomo Mesh Harnesses are the best of the best and available in blue, green and red!